Injectables, Services, Providers – whatever you call them (I like to call them services), they are a critical part of building applications with Ionic 2. Components are the backbone of our applications, they are responsible for what we actually see on the screen, but services play an important role in providing information to our application and performing tasks for us. This tutorial isn’t going to focus on how to build specific services, but rather how they work and how to use them in general. We are also going to cover an important distinction between two different methods of adding them to your applications, and how that can drastically effect how they function. Which of these two you choose can matter a great deal. If you add it to the bootstrap then a single instance of the service will be created that all components in the application will share – making it a great way to share data between components. If you add the provider to an individual component, then a new instance will be created for just that one component. Remember that a class is just a blueprint for an object you want to create. So we can create multiple copies of the same service, all of which operate completely independent of each other. 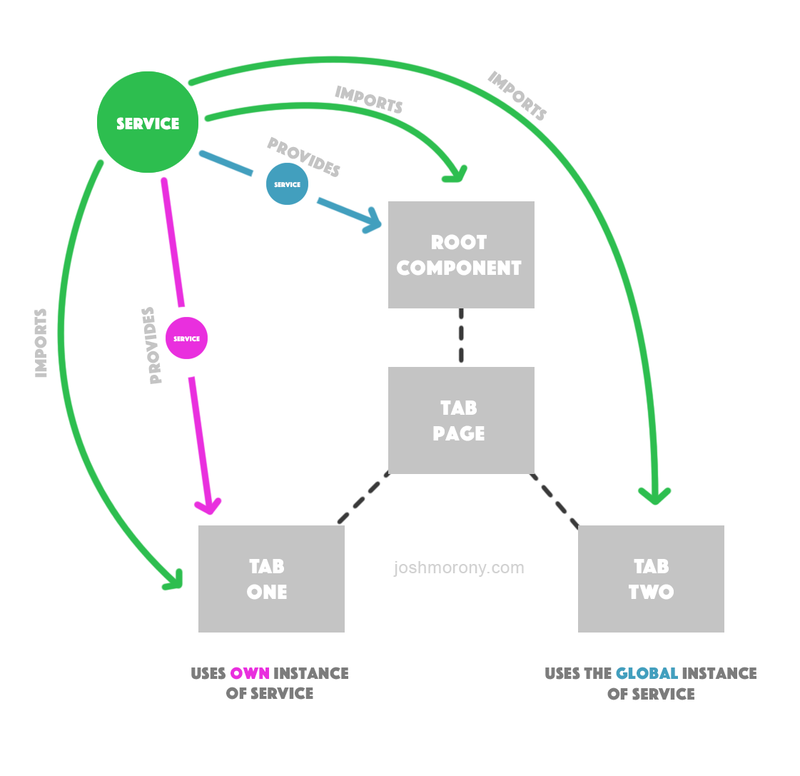 In the example above the service is being provided in the root component (meaning it is added to the ionicBootstrap function) so that makes that instance of the service available throughout the entire application. This means that Tab Two can access it without declaring its own provider (as could Tab Three and Tab Four if they exists), but, the service still needs to be imported. Tab One in the example above also has its own provider (meaning the service is declared inside that components decorator), which means it is creating its own instance of the service. The end result is a single service being shared by the entire application, except for Tab One which has gone and created its own copy of the service. It’s important to understand the difference between these approaches. Suppose you had created a service to store some data and share it between pages in your application. If you provide the service through ionicBootstrap then everything will work great, because the entire app is sharing the same instance of the service. But if you were to provide the service in each component individually, they would all have their own instances of the service – if one page saved some data to the service, and you tried to access it from another page it wouldn’t work. Once you get your head around it all seems pretty straightforward, but I think it can be pretty confusing. I’m going to run through a simple example which should illustrate the point pretty well. We are also going to run a few more commands to generate a test service for us to use, and a couple of pages that we will use as tabs to demonstrate some differences in the two approaches. Since we want to use a tab structure so that we can easily switch between these two pages, we are going to have to do a bit more work to set it up. Now we have imported our two pages and set them up as tabs. If you load up the application now you should be able to switch between the two tabs. This is the default provider that Ionic generates (except I have removed the comments for brevity). It contains some dummy code that fetches some data from a hypothetical JSON file. We are going to modify this to make it a lot simpler. Much simpler. Now we can set a message by using the setMessage function, and since the message member variable is publicly exposed we will be able to access that directly. Now that we have our service, we need to import it, provide it, and inject it, before we can use it. As I mentioned, we can provide the service either through the ionicBootstrap function in the root component, or through the component itself – both of these will have different effects. We are going to start off by adding it to ionicBootstrap which will create a single instance of the service for the entire application. Now we are going to have to set up our two pages so that they can also make use of the service. In the template we are simply displaying the message that we are accessing through the service (which we will set up in the class for this component in a moment). We also add a button to the header that when clicked will call the changeMessage function – this is what we will use to change the message in the service. In this class we are importing the service, and then we inject it into the constructor which makes it available to use throughout the class. Since we have already provided it in the root component, we have everything set up that we need to use the service. We have also set up the changeMessage function to change the message stored in the service to “Page one rocks!“. Now let’s do the same thing for page two. We’ve done exactly the same thing for page two, except that its changeMessage function will change the message to “Page two rocks!” instead. In both of the pages we are importing the TestProvider but, and this is the important part, we are not declaring it as a provider in the decorator. This means that both of the pages will use the instance of TestProvider that was created in the root component, meaning if we modify the message in one page, then it will effect the other. Give it a try, initially both tabs should say “I’m new here”. If you click the button on the first tab both tabs will change to “Page one rocks!”, and if you click the button on the second tab both tabs will change to “Page two rocks!“. Now let’s see what happens when they create their own instance of the provider. As you can see, we are now adding a provider for TestProvider directly into each components decorator. It is now no longer necessary to have the provider in ionicBootstrap, however keeping it there won’t have any effect so it’s not important to remove for this demonstration. Now if you click the button on one tab, the message will only change for that one tab. Each tab now has its own copy (instance) of the service, so when the changeMessage function is called, it only effects that components own instance of the service. Depending on the circumstance, either method for providing a service in your application may be desired, but it’s important to understand the distinction between the two, otherwise you could find yourself running into some frustrating issues.